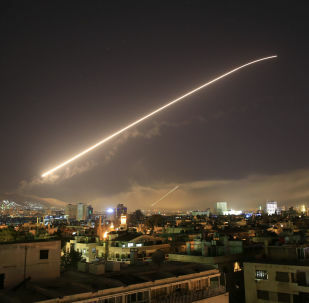 On April 14, the United States, the United Kingdom, and France launched strikes on a number of targets in Syria in response to an alleged chemical attack in the city of Douma, a Damascus suburb. The US warships Porter, Cook, and Higgins and French and UK Mirage and Tornado fighters fired over 100 cruise and air-to-surface missiles at "civilian and military facilities." Russia has not transferred S-300 air defense missile systems to Syria, a military-diplomatic source told Sputnik on Wednesday. 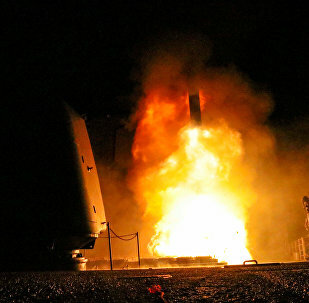 The United States, the United Kingdom and France, have fired over 100 cruise missiles at Syrian targets in response to an alleged chemical attack in Douma despite lacking evidence on Damascus' involvement. Russia and Syria have condemned the attack, with Moscow saying it was designed to disrupt the peace process in the country. MOSCOW (Sputnik) - The US, the UK and France, which hit Syria, have supported militants since the start of the country's civil war and failed to help Damascus in the anti-terror fight, Syrian President Bashar Assad said on Monday at a meeting with Senior Assistant to Iran’s Foreign Minister for Special Political Affairs Hossein Jaberi Ansari. In an interview with Sputnik, Samer Shiha of the Syrian People's Council addressed the missile attack the US, UK and France launched against Syria last week, and berated French President Emmanuel Macron for failing to deliver on his promise to pursue an independent foreign policy. 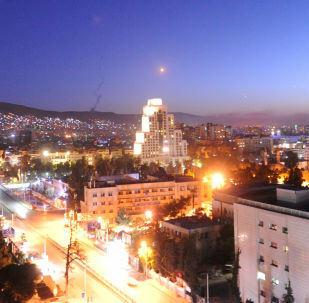 Konstantin Sivkov, a military specialist and member of the Russian Academy of Sciences, told Sputnik that the American strikes on Syria have hit the Americans themselves. For instance, the American missiles’ image has been undermined while the Russian air defense systems’ image has grown. Speaking at a meeting with the UN Secretary General's Special Envoy for Syria in Moscow, Russian Defense Minister Sergei Shoigu has stressed that last Saturday's US airstrikes on Syria have destabilized the situation in this Arab country. On Thursday, US Congressman Thomas Massie announced that the US director of national intelligence, the defense secretary and the secretary of state had “provided zero evidence” showing Syrian President Bashar al-Assad used chemical weapons against the Syrian people in Douma. 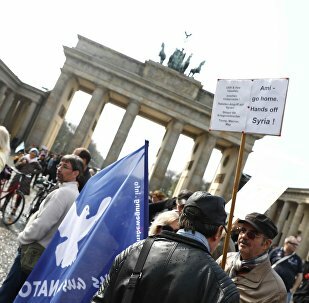 MOSCOW (Sputnik) - Approximately 1,500 Germans took to the streets of Berlin on Wednesday to protest against the US-led strikes on Syria and call for an end to war, Alexander Neu, a member of the Bundestag from the left-wing Die Linke party, which organized the protests, told Sputnik on Thursday. 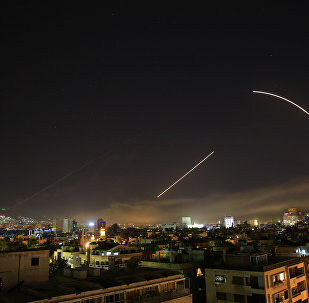 On April 14, the United States, France and the UK fired over 100 missiles at multiple targets in Syria in response to the alleged use of chemical weapons by government forces in the city of Douma in Eastern Ghouta. Almost two-thirds of the rockets were shot down, according to Russian military. BEIJING (Sputnik) - Chinese President Xi Jinping has noted the need for a comprehensive, fair and unbiased investigation into the alleged chemical attack in Syria during phone talks with UK Prime Minister Theresa May, the Xinhua news agency reported on Thursday. In an interview with BFMTV, the leader of the right-wing National Front has cast doubt on the credibility of the claims made by French authorities in relation to missile strikes on Syria in response to the alleged use of chemical weapons in the city of Douma in Eastern Ghouta. The Swedish TV-channel TV4 has sparked outrage by offering its viewers a skewed picture of reality by substituting "the US" with "Russia" in a critical news report on the US-backed attacks against the war-torn middle-Eastern country. MOSCOW (Sputnik) - A total of 37 percent of the UK public opposes the country's participation in the recent Western attack targeting Syria, while 35 percent support the involvement in the operation, a recent survey showed Tuesday. 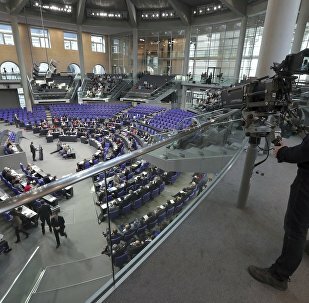 BRUSSELS (Sputnik) - The recent attack on Syria conducted by three Western countries was a "serious excess" in a political sense despite its negligible military effect, а member of the European Parliament from Italy told Sputnik on Tuesday. 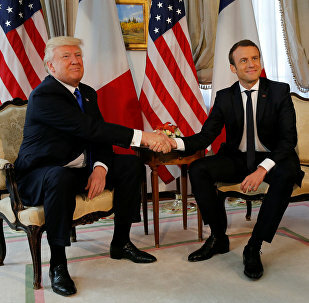 PARIS (Sputnik) - French President Emmanuel Macron needs the support of the United States, particularly of his counterpart Donald Trump, on Syria in order to pursue an active policy in the Middle East, experts told Sputnik. The US will remain in Syria until its goals there are accomplished according to Nikki Haley, the US ambassador to the UN. She has said that ensuring that chemical weapons are not used in any way that poses a risk to US interests is among the three goals Washington is pursuing in Syria. The defeat of Daesh and monitoring Iran are the other two aims. US missiles raining down on Syria last Friday night were fired in violation of not only international legal precedents, but also in flagrant disregard for the United States’ own constitution, a Harvard-trained lawyer and renowned professor of international law told Radio Sputnik Monday.